Mr. Manoon was back to take our family to Ayutthaya which us just a short ride from Bangkok. The kids were really fascinated with everything there was to see and I don’t really think one day is enough. Our day started off with Mr. Manoon our driver from the floating markets picking us up to drive to Ayutthaya about 80km outside of Bangkok which can take anywhere between an hour and a half or two depending on traffic. Unfortunately, ours was the 2-hour journey but it was worth it. Ayutthaya may not mean much to most people but it was the largest city by population in the world at one point and was the capital of Siam(now Thailand) for nearly 500 years when the Burmese razed it. But there was still plenty to see. We started off at a really impressive wat which at first we thought was all there was to see in Ayutthaya. Yet we barely scratched the surface. The complex was extensive with even the smaller less visited temples and wats being impressive. After a quick lunch, our family headed off to explore the canals via long boat. Although the actual canals were not very picturesque it certainly allowed our family to quickly hop from site to site which would have proven much more time consuming had we attempted to drive. Plus it’s pretty darn cool to pull up to this huge ruin on the side of the river bank via boat. Once we finished up our boat ride which allowed us to explore three sites we finally headed off to Wat Mahathat which is the famous temple which has Buddha’s head surrounded by tree roots. Our family got there at the perfect time as most tour operators had already left so we had the entire place to ourselves. 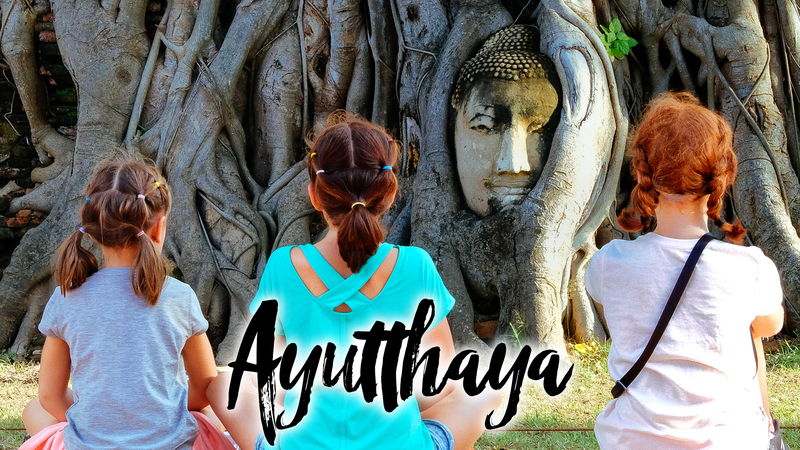 A photo session ensued and we left Ayutthaya feeling like we hadn’t missed anything. A long day to be certain but the kids loved it and we got to be early as our family had another big day planned the next day.